This product from Chess Baron: The Aristotle tablet hand held chess computer is the jewell in the crown of electronic chess - and now with ChessBase installed. 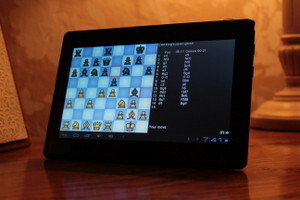 It is a superb high-spec tablet touch screen chess computer exclusively from ChessBaron. Play in portrait or landscape. You don't have to play at maximum strength, but using the latest in ARM chip technology - at the highest setting the Aristotle will beat most of the worlds chess players. It can be set down a few notches for us mere mortals. 1. 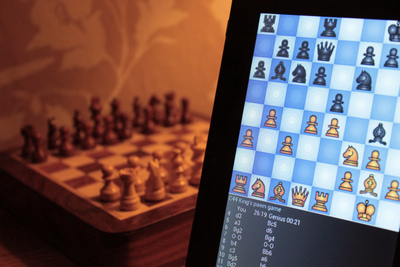 Analyze the strength of your moves through the computers analysis engine. 2. Optionally connect online and select timed or untimed games against any of thousands of other players accross the world. 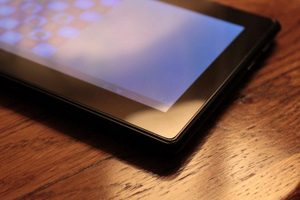 Now upgraded to a QUAD CORE processor! ELO 2600 Max, Portrait or Landscape, Screen 15cm x 8.5cm, Rechargable. Upgraded to Quad Core!